It's been a while since I've posted anything regarding the game I'm currently working on, Crash Planet. A lot of work has gone into it since the last screenshot was posted and there's still much more to be done, but here's a more recent shot featuring aliens, bullets and our protagonist. 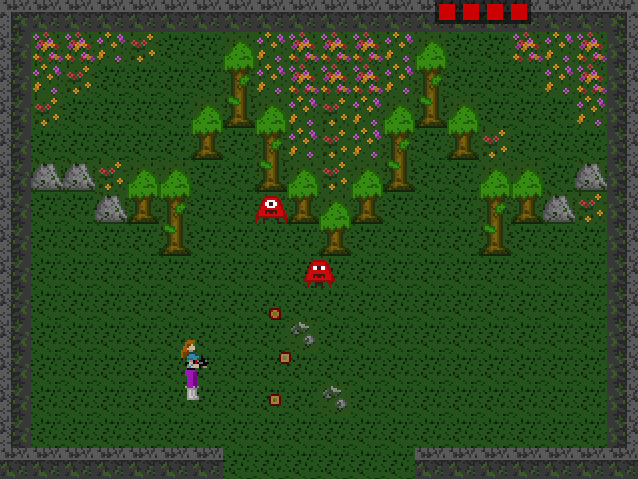 I decided I'd go ahead and post a screenshot from the new game I've been working for Screenshot Saturday. As mentioned before, the new game will draw heavily from the NES classic The Guardian Legend. So without further delay, behold: the first screenshot from Crash Planet! Full disclaimer: nearly all of this art is placeholder. I have been doing a lot of work on the game's tilesets, but first I just used placeholder stuff to build out the world and get a character moving. If you've played through Night of the Loving Dead, you may recognize the strapping lad in this particular shot.